Home › Apiary › Part 2: The Little Known Super Pollinator! Part 2: The Little Known Super Pollinator! 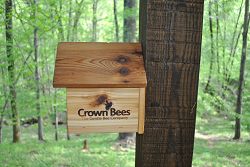 Today’s issue is Part 2 of a two part interview with Dave Hunter of Crown Bees. We will learn how we can prepare for our Bees and where we can find more information on the topic. We are collecting bees from backyard gardeners. We’ve got a thing called Bee Mail. Once a month, in fact I’m writing it right now, we tell you what to do. After a full season, you’ve got enough information there that you should have more cocoons then you started with. You’re getting free tubes, reeds and wood trays. We’ve got gift certificates. We’re trying to buy back as many bees as we can. The Blue Orchard is wonderful all through there. Up around the east coast, back in the 80’s, there was a Japanese bee, called a Horn-face bee, that was given to the U.S.
Actually that’s not saying a lot. There has been research out there done by Penn State. When you try them on different bees, all of a sudden the one that’s safest for the honey bee isn’t safe at all for bumbles or mason bees. We’re learning very specifically that TruGreen is a great product that, when you put that down, you’ll find no mason bees in your yard or anything down wind. They all just run from that smell. Good for them that they can. The bees just vamoosed. All that said, I think the solitary bees are probably, if they’re not nesting, there’s a problem, maybe. Everyone keeps looking at the symptoms, not the common problem. If you go back 100 years ago, when the honey bees didn’t have these problems, what did it look like? Honey bees got big, they split, they swarmed. Why a half mile? I’m guessing foraging probably, because they’re competing for all that food out there and probably disease control. That’s natural. We’re also learning the dirty bees, the ones who are sick, will also go into clean hives. They go into the wrong hive. Now you’ve reduced and you’ve put in a full compliment of mason bees or even half mason bees, you’re able to reduce that overlap of the honey bees substantially. Go picture a 20-acre mono crop. You’ve got 1,000 apple trees or whatever all in a row. Your wild bees, solitary bees and everything, they come in from the edges of the orchards and they go back to the nest. We also find that the mason bee flies a little better in light rain, if it’s colder or windier. It flies more because it has to pollinate. It has to get food in its six weeks or it doesn’t lay its eggs. If I don’t have mud, that bee species has to have mud. Go back in your backyard. You’ve hung this thing up and you’ve got lawn, beauty bark and asphalt. About six trips of mud gathering has me to seal that hole. If I don’t have that clay mud, I don’t have that mason bee. In your orchards, a lot of orchards are along river beds and lake beds where its too sandy. When we’re working commercially, we actually bring in just sticky mud, one big handful or 2 per acre, putting them in the ground and putting a little dripometer on them, keeping that mud moist. Put a little hole in the ground, just a shovel hole, slap that mud on the shady side, a south wall. 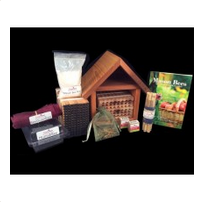 Now, you can raise mason bees. That’s mason bees spring. After the summer, July 1st, there’s no mud out there natively, so you’ve got leafcutter bees out there, a real cool bee. When you’re actually done, you’re looking at this in the fall, it looks like a little cigar, a green, leafy cigar, real thin. Within these leafy cocoons are pollen and eggs. The summer, July all the way through to maybe early August, you’re now putting out leafcutters. We had an attorney, out in Long Island I think, that did an experiment last summer. He had a home garden, a real tall wall and then an office garden. He says, “I’ve never had so much vegetables off this one side. Doubled my tomatoes, way more peas and everything. Asparagus, no difference. Zucchini was surprisingly no difference.” He ordered a whole lot of leafcutters for a summer garden. Dave Hunter: Yeah, it’s an easy one. What we’re trying to help the backyard gardeners with is to realize that, sure, you’ve been told about the watering, the sun, the soil and everything. You plant your plants. 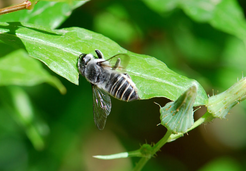 It just tells you everything about both types of bees, mason bees and leafcutters. I’d float through there. Secondly, I’ve got a thing called Bee Mail, just once a month we say hey, do this. If you sign up for that, every other day we just give you a little, short mini tour. Here’s what about holes. Here’s what about mud. Here’s what about leaves. It’s all for free. We just want to teach you to be successful. I would at least start there. Instead of just drilling blocks of wood or getting bamboo, bamboo is just as bad, there’s some really crappy things out there. You can’t really open bamboo. It’s just too structurally sound. We’ve got complete kits, all the accessories. It’s all right there. There’s some cool stuff. I think with my own wallet,might want to spend money here and not there. You can hunt around and find exactly what you want. 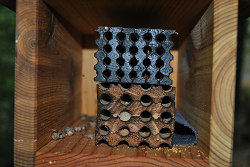 Store filled nesting holes (open ends up) in an unheated garage or shed that is dry and secure, after bee activity stops. Overwinter bee larvae in the nesting holes until next summer. Leaving them outdoors exposes them to pests and weather elements. ‹ Part 1: The Little Known Super Pollinators!